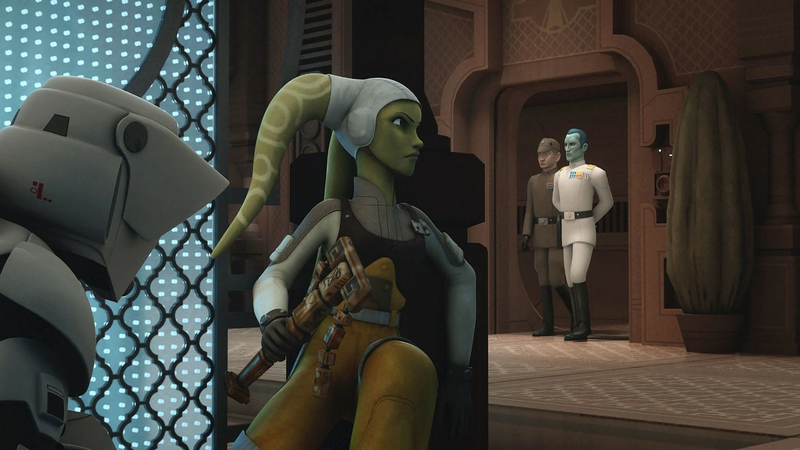 My Top Ten Favorite Episodes of Star Wars Rebels Season Three – I'd Rather Be Geeking! In this episode, we got to see how Wedge Antilles joined the Rebellion. After hearing from Fulcrum that there was Imperial pilots that wanted to defect, the Rebellion sent Sabine Wren to go undercover to get them out. Wedge, Hobbie (who first appeared in “The Empire Strikes Back”), and Rake all depend on Sabine to get them out alive. Unfortunately, Rake was killed, but Wedge and Hobbie went on the be some of the greatest pilots in the Rebellion. Ezra also learned a lesson on patience from Kanan. This episode was definitely an interesting one. I don’t think I’ve ever been more intimidated by a villain until I watched this episode. In this one we saw Hera and Ezra try to retrieve an old family heirloom for the sake of Hera’s deceased mother, but they are stopped by Grand Admiral Thrawn. 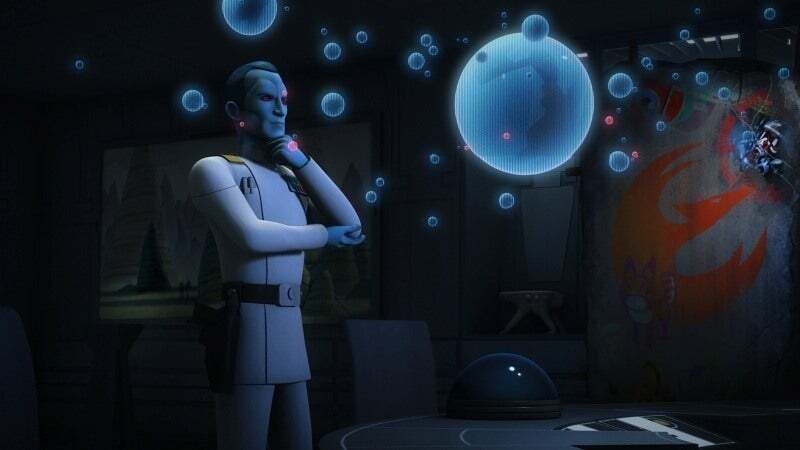 While the other Imperials don’t recognize the two rebels, Thrawn knows everything about them. Hera sees that she doesn’t need a heirloom to keep her mother’s memory alive and is able to throw the unpredictable at Thrawn by blowing up her own house. Thrawn let the rebels escape on purpose though, he just wanted to study them at the time. All in all, this was a great episode. Finally, we got an episode that focused more on the Imperial side of things. And once again, Thrawn was a beast. Here we learned that not only is he extremely intelligent, but he can take you out within a matter of seconds. When Agent Kallus and Ezra thought they had fooled the Grand Admiral that Lieutenant Lyste was Fulcrum, they had failed miserably. So once Thrawn was onto him, we knew that it was only a matter of time before the Fulcrum Agent’s time was going to run out. The first two-part episode for season 3 was amazing. Ezra’s dark side was emerging just beautifully. Ezra learning lessons from the Sith Holocron was exactly what I wanted. But Ezra wasn’t the only one that was learning lessons, Kanan had some learning to do as well. His just weren’t about the dark side. One of my favorite moments in the whole season is in this episode, that moment when Kanan met the Bendu and learned to see through the force. Everything about that part was perfectly done. The Bendu was such an interesting character, but I don’t quite get him. One day he wants Kanan to come see him, the other he wants him to leave the planet and never come back. He just got more confusing as the season went on. Hopefully he will be explained. Anyway, by the end of the episode, the Rebels liberated some Y-Wings, Ezra got a promotion and then a demotion, all kinds of crazy stuff. It was all very interesting. Yes, this episode had a sad ending, but besides that, it was brilliant. Seeing Sabine fight Gar Saxon with a lightsaber was one of the greatest moments Star Wars Rebels has ever had. Getting to know about Sabine’s family was nice too. Maybe one day we might see her father? It was hard to see her leave, since she had been on the show for so long. Luckily she would go on to return in the season’s finale. This episode was one of the best! For some reason I can’t stop watching this episode, it never gets old! This episode introduced thing to us that I never imagined could happen. Maul and Ezra putting those holocrons together was awesome and nothing like I’ve ever seen happen in the Star Wars galaxy. Not only that, but it showed that Maul had the ability to perform the Mind Probe on his captives. 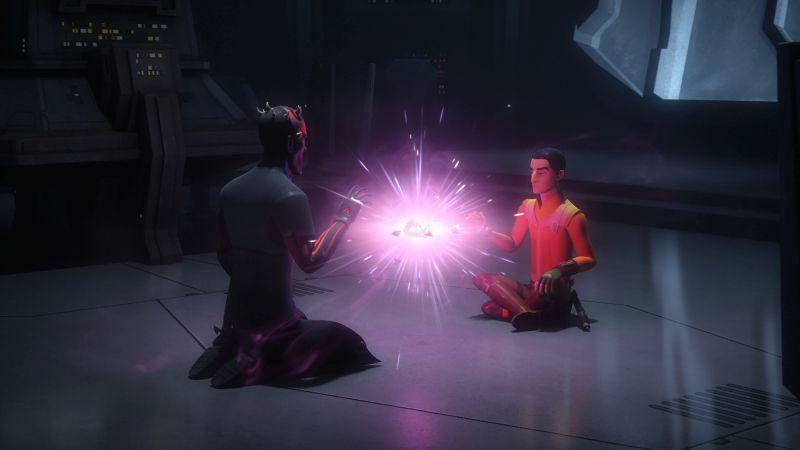 Also, Ezra and Kanan returned to the Bendu to retrieve the Sith Holocron, since back in “Steps Into Shadow” Kanan gave it to the Bendu for safe keeping. While they were looking for the Holocron, the master and apprentice found balance with each other, which was heartwarming to see. Of course, I can’t forget about that moment when Maul runs to his ship shouting, “He lives!” To himself. He obviously meant Obi-Wan-Kenobi, hence their battle in “Twin Suns”. 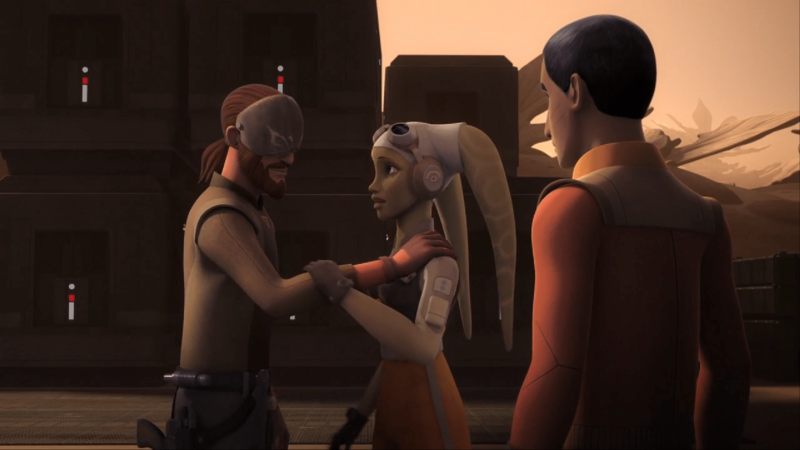 I was so glad to have a Sabine-centered episode when this one aired. It was beautiful. The soundtrack, the animation, the story, all of it. Kanan and Ezra training Sabine how to use a lightsaber was giving me major flashbacks of season one when Kanan would train Ezra. It shows just how much the two Jedi have matured in their power. 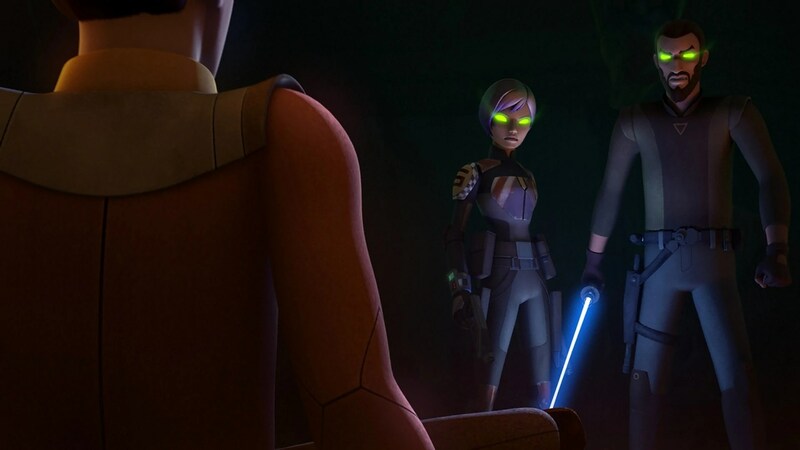 And Sabine telling about her past as she battled Kanan was was very interesting. It was good for Sabine’s character to finally be explained. This was the creepiest episode in season 3 for sure. Ezra seeing visions of Maul was terrifying, extra points on that thunderstorm that was happening at the same time. Here the Bendu only got more confusing. When Ezra and Kanan went to the Bendu for help and Maul showed up, the Bendu just disappeared. I really want to know how he does that. Anyway, Maul and Ezra go to Dathomir together, which was cool. The scariest part was with the ghosts of the nightsisters! It only got worse when they possessed Kanan and Sabine! And I can’t forget about Sabine finally obtaining the Darksaber! Of course, all was well by the end of the episode, but this episode was not one that can be easily forgotten. For obvious reasons, the finale is on this list. Though it didn’t really live up to the season 2 finale, it was still incredible. I was really scared that Grand Admiral Thrawn was going to die, but he luckily didn’t. 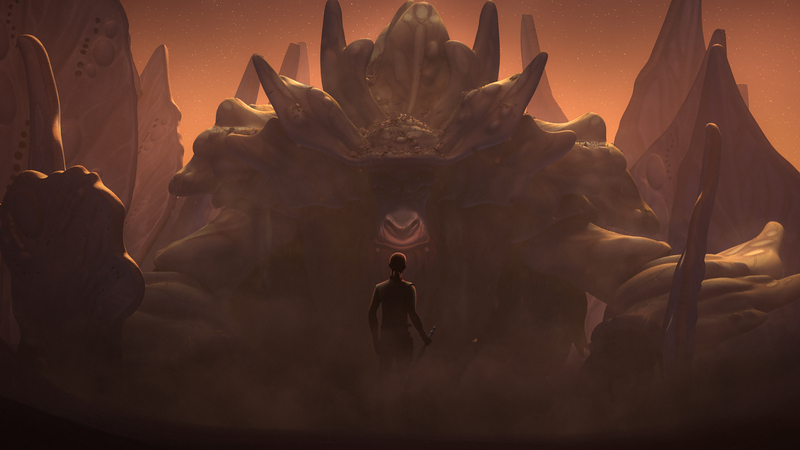 And this episode just made the Bendu more mysterious, but cooler. Him turning into a storm and destroying everything was awesome. Thrawn was equally as cool. And I can’t forget about poor Commander Sato! I was thinking that he was going to die in this episode, and I was right. Oh yeah, cheers to those two nameless pilots who sacrificed themselves with Sato! I can’t wait to see what season 4 will have for the Ghost crew! At first, I didn’t really like this episode, but when I watched it again it quickly made it’s way to the top! Ezra traveling to Tatooine and finding Obi-Wan-Kenobi was what I had been waiting for. Though the Maul vs. Kenobi wasn’t what I had expected, it was nice to have some closure to Maul’s story. But that ending, it was the best! Aunt Beru calling for Luke and seeing him run across his front yard to his house was just the cameo that Rebels needed. Not to mention “Binary Suns” playing in the background. This is an episode that I’ll never forget! So that’s my list! Did you like any of these episodes? What were your favorites? Let me know in the comments! More information on Star Wars Rebels season 4 will be announced at the Star Wars Celebration on April 15, 2017. 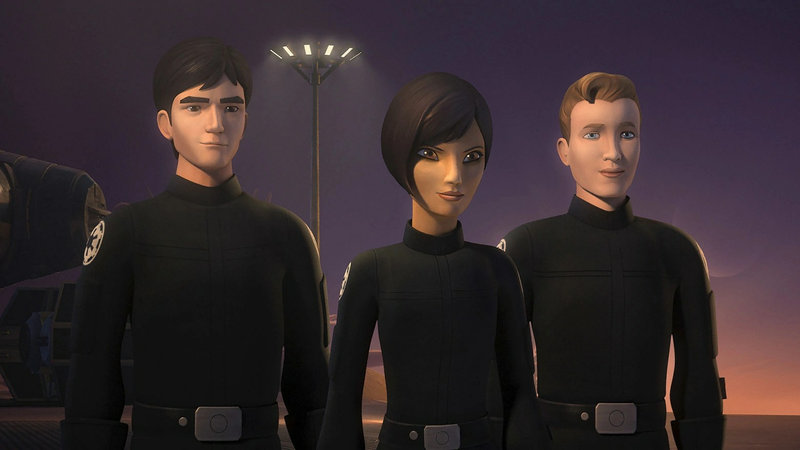 Will K2-S0 And Cassian Andor Appear In Star Wars Rebels Season 4?